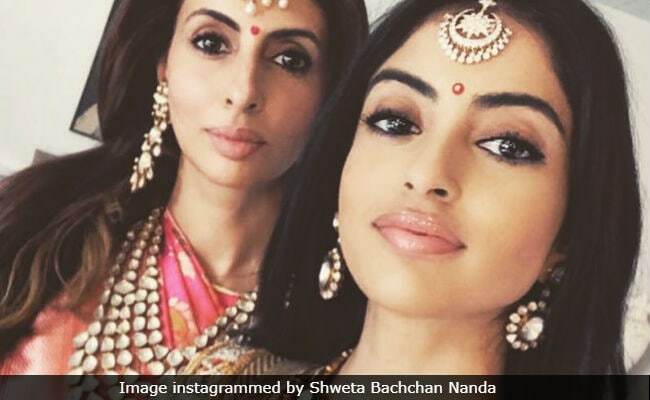 Shweta Bachchan Nanda has always been vocal about not wanting her daughter Navya Naveli to become an actor and on her latest appearance on Koffee With Karan 6, she explained why. Shweta said she doesn't know if her 21-year-old daughter has it in her what it takes to be an actor and said that Navya has to be totally "driven and passionate" about acting if she wants to make a career out of it. "I don't know what Navya's talent is. I feel, unless she's completely driven, passionate and talented, she has no business being here. Just because she's related to some famous people doesn't mean she has what it takes," Shweta said on the show, which aired on Sunday. When Karan Johar said that Shweta "drilled it" in Navya's head that the film industry is a "dark, strange and unstable place" because of which she may have never given films a shot at all, Shweta agreed and elaborated: "I think I was excessive (in my analysis). I think I was unfair. I think, I only thought selfishly." Explaining why she did what she did, Shweta said: "It's one of the bonuses from coming from a family that's involved in the movies. I'm seeing the second generation of actors in my family. I also know the heartbreaks and I think I know it really well. I see their faces when things don't work out... and I don't want yet another member of the family to be in the business." Shweta is the daughter of actor couple Amitabh Bachchan and Jaya Bachchan. Her brother Abhishek is married to actress Aishwarya Rai Bachchan and they are parents to Aaradhya. A few years ago at an event in Mumbai, Shweta Bachchan Nanda had said something similar when she was asked if her daughter wants to act in films. She had said: "I will be worried if (Navya Naveli) plans to be an actor. I don't think it is as easy as it looks. You have to work extremely hard, especially if you are a woman. And I wonder if she has in her to bear with all of it. Also, there is a lot of failure involved, which many people don't see. The failure is personal, your acting skills, the way you look on screen is slashed out in open," reported news agency PTI. Navya Naveli is a bona fide celebrity on social media and her videos and pictures frequently send the Internet into a meltdown. Navya Naveli is the elder of Shweta Bachchan Nanda and Nikhil Nanda's two children. Navya's brother Agastya is 18-years-old.